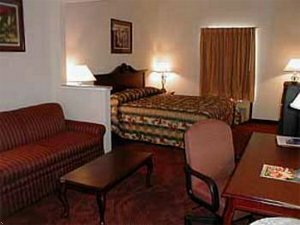 All-suite, all non-smoking hotel for the road warrior's home away from home. Offering the best amenities for the weary traveler such as high-speed Internet access, oversized work desk and ergonomic chair, microwave and refrigerator in every room. Indoor pool, oversized hot tub, Star Trac and Precor equipment in exercise room and of course a deluxe continental breakfast including hot items. The business center and fax services are complimentary. All Comfort Suites are smoke free. Heading West on 54, stay in right lane across MO River Bridge. Take Hwy 50 West Sedalia exit. Travel 4 miles. Take Apache Flats exit. Turn right onto Outer Road, left into hotel. Heading South on Hwy 63, take 54 West. Stay in right lane across MO River Bridge. Take Hwy 50 West Sedalia exit. Travel 4 miles. Take Apache Flats exit. Turn right onto Outer Rd, left into hotel. Heading East on 50 from Sedalia, take Truman Blvd. exit. Turn right at stop light. Take left onto Outer Rd, Country Club Drive. Travel .9 miles. Take right into hotel. Heading West on Hwy 50 from Lake of the Ozarks. Stay on Hwy 50 West through Jefferson City. Take Apache Flats exit. Turn right onto Outer Rd. and left into hotel.